At Surface With A Smile, we have all the tools necessary to bring back your countertops, vanities and tabletops back to its original beauty. 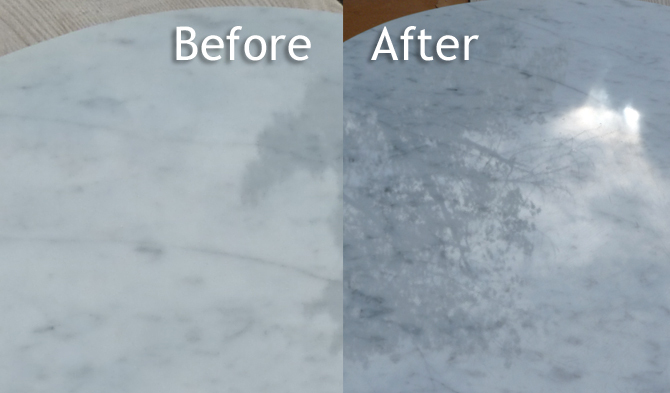 Kitchen and bathroom countertops take a tremendous amount of wear and are susceptible to etching and dullness. This is especially true for marble countertops and travertine countertops. At Surface With A Smile, we have invested in state of art tools to solve your problem. Let’s look at the DS 301 Planetary Polisher. The DS 301 Planetary Polisher is a rugged, planetary powered tool designed to produce a flat, swirl free finish on countertops, floors, walls and steps. The unit will grind, hone, polish or clean concrete, terrazzo, marble or granite surfaces using coated abrasives, diamond polishing systems, light weight diamond wheels or brushes. This is a true planetary gear driven tool. The 12” platform turns at a lower rate than the higher rotational speed of the 5” platens. This combination of rpm provides the optimal speed for diamond polishing, producing a perfect finish 5 times faster than a single head polisher. The unit is powered by a heavy duty FEIN variable speed polisher (900-2700 rpm). A center coolant feed, precision bearings and sturdy construction make this the ultimate tool for perfect flatness and a superior polish. We also have single head wet polisher as well to get in behind small areas or for edges.